Practical, lightweight and portable 8.5inch writing pad. You can use it for children scribbling, calculation exercising, daily memo writing, office note taking & etc. Easy to reuse, one writing pad can save thousands of tree. 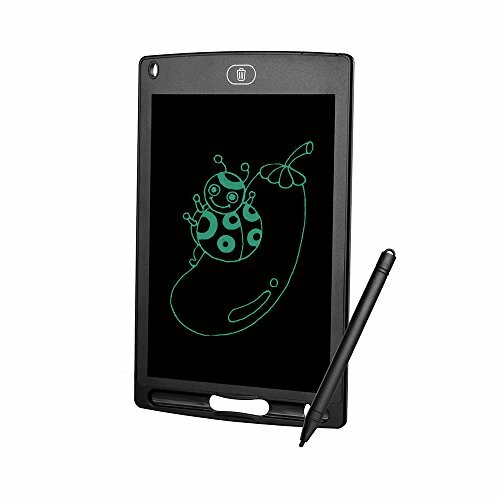 Eye-protecting Ultra-bright LCD Screen: Pressure-sensitive, write and draw by included stylus pen or fingernail without any delay, smooth writing experience. Long-time Retention: The written content won’t disappear until you press the Clear button, can be used as a daily memo pad. Long Batterylife and Safe: One 130mA CR2020 battery can last for 2 years. The battery compartment is well fixed so children won’t have access to the battery. Ultra-thin Design: 8.5 inch screen, 0.5mm thickness, super portable for you to carry around. Wide Application: Designed for people from Businessmen, office staffs, students to kids and more. It’s real a perfect replacement for paper. Be environment friendly and portable.